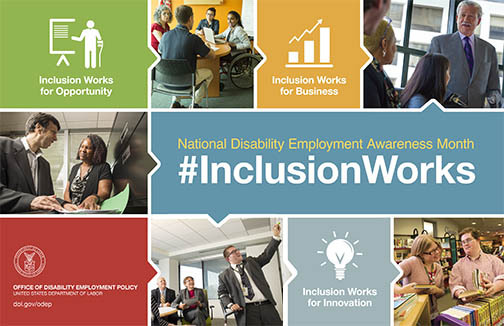 Carey Services will participate in the 71th annual observance of National Disability Employment Awareness Month during October by emphasizing education through the agency’s social media outlets and their website. The theme for this year’s observance is #InclusionWorks. The theme highlights the importance of including people of all backgrounds and abilities in the workforce. NDEAM has been observed more than 70 years. It began when returning World War II service members generated interest in acknowledging people with disabilities and their contributions to the workforce. On August 11, 1945, President Harry S. Truman signed a congressional resolution declaring the first week in October “National Employ the Physically Handicapped Week.” The “physically” was removed from the title in 1962. Carey Services has an employment services department focused on community employment, and many of the agency’s programs have components that help people work toward greater independence. Community employment many times is a high priority for clients.